Pumpkin Pie. Love it or hate it. I’ve managed to convert many who swear they HATE pumpkin pie with this recipe, including my picky husband. This isn’t your traditional pumpkin pie and I refuse to make what Libby’s Canned Pumpkin calls “Famous”. Sorry Libby. This is my first recipe for the Farm and probably one of the first recipes that I’ve had to painstakingly write down. But, in the spirit of Thanksgiving I completed the task and offer you my pie. Yay! In your most recent holiday CSA share, you received those wonderful little pumpkins known as sugar pies. 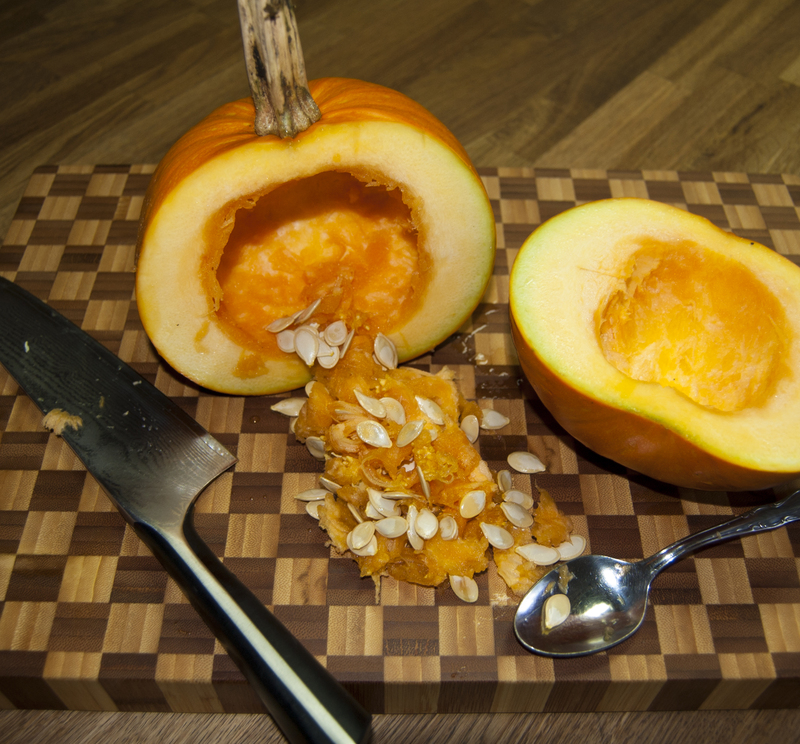 These aren’t your typical carving pumpkins and are much sweeter and less watery making them perfect for all of your pumpkin dishes. Below, I’ve included instructions on how roast and prepare your pumpkin. 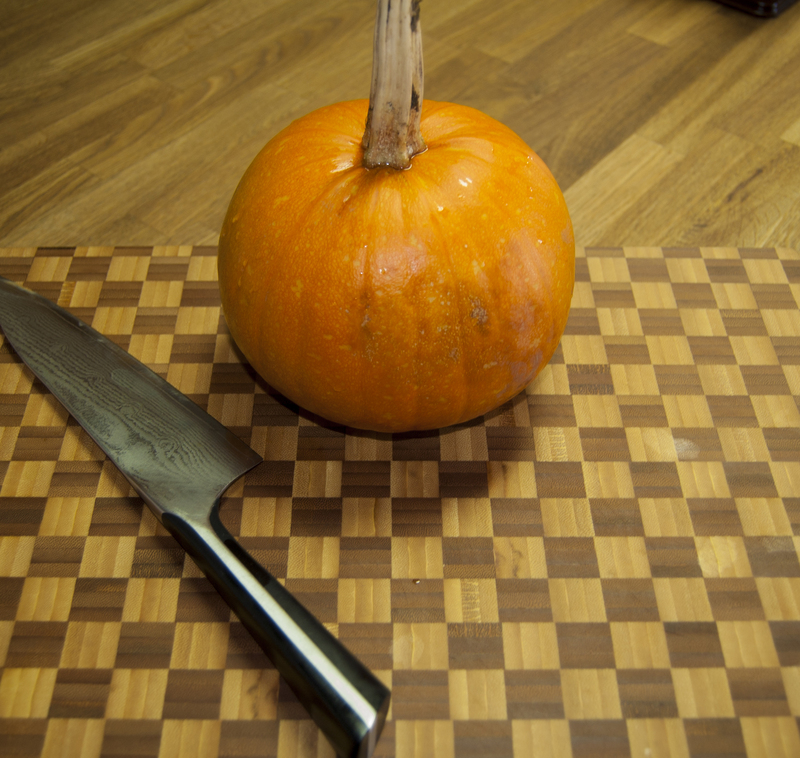 Grab a SHARP knife and split the pumpkin in two. With a spoon, scrape out all of the seeds and goop from the center. You can reserve these for later use if you plan on roasting these as well. 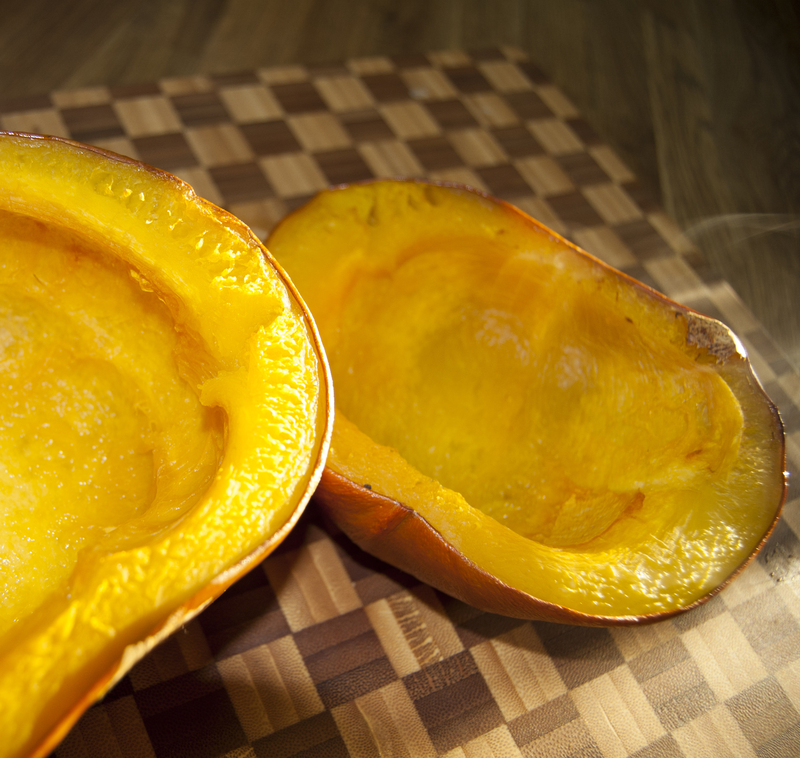 Brush the pumpkins with butter on the inside and place face down onto a roasting pan. Line it with parchment paper if you want to avoid scrubbing the pan later. Roast at 350F for around 45 minutes or until tender. Roasting time varies depending on the size of your pumpkins. When it’s done, you should be able to easily stab it with your fork. Don’t worry, it can’t feel a thing. When it’s done, remove the the pumpkin from the oven and allow it to cool for around 15 minutes. From there, you can use the puree as-is or cook it down to remove the moisture. For the pie recipe I used it as it was. I roasted my pumpkin the day before I embarked on making the pie and crust. You can easily do the same by putting it into a container and placing it in your freezer until you’re ready to use it. Ok, not everyone likes making homemade crust. I know I’m terrible at forming the edges and making it look like something out of a Martha Stuart fantasy. But… I like the taste of it so I’m ok with an imperfect pie edge. If you’re not feeling adventurous you can always buy a pre-made pie crust. I won’t judge you. 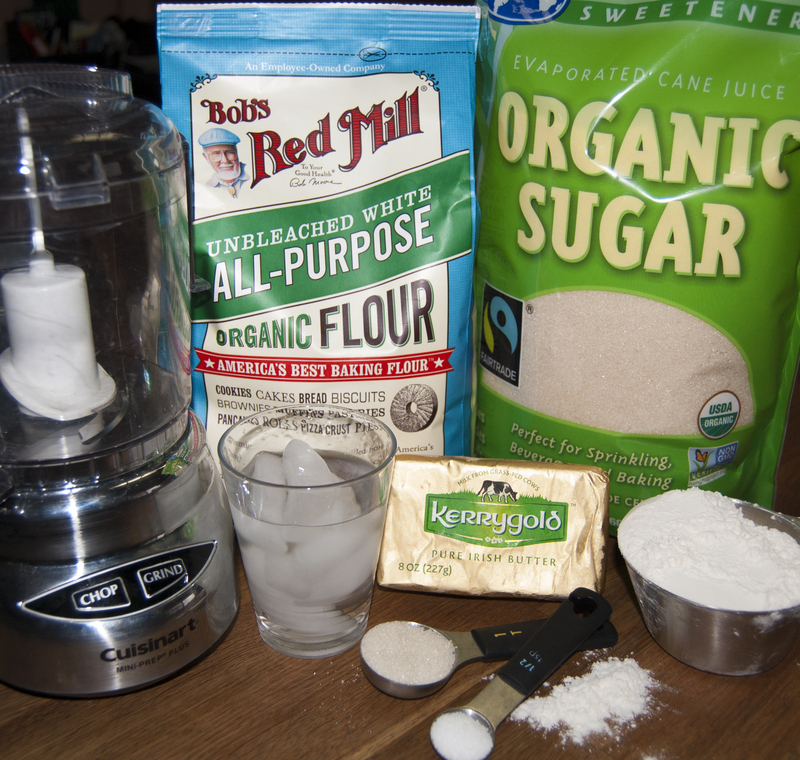 In a large bowl or food processor with pastry attachment, combine the flour, sugar and salt. I’ve used the bowl method for this crust – at this point you can work the butter in with a fork. 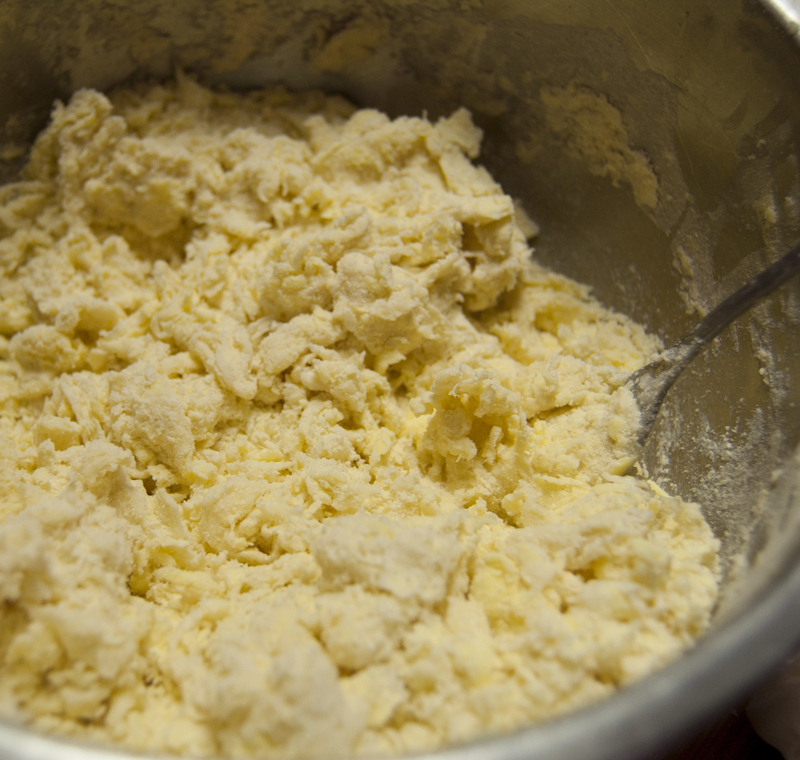 Blend until you’ve incorporated all of the flour and butter together and it resembles coarse crumbs. Begin adding ice water 1Tbsp at a time until your mixture can be formed into a ball. Split the dough into two and roll into balls. Wrap in plastic and refrigerate for at least 4 hours or overnight. The end result should be two yummy crusts and a messy counter. 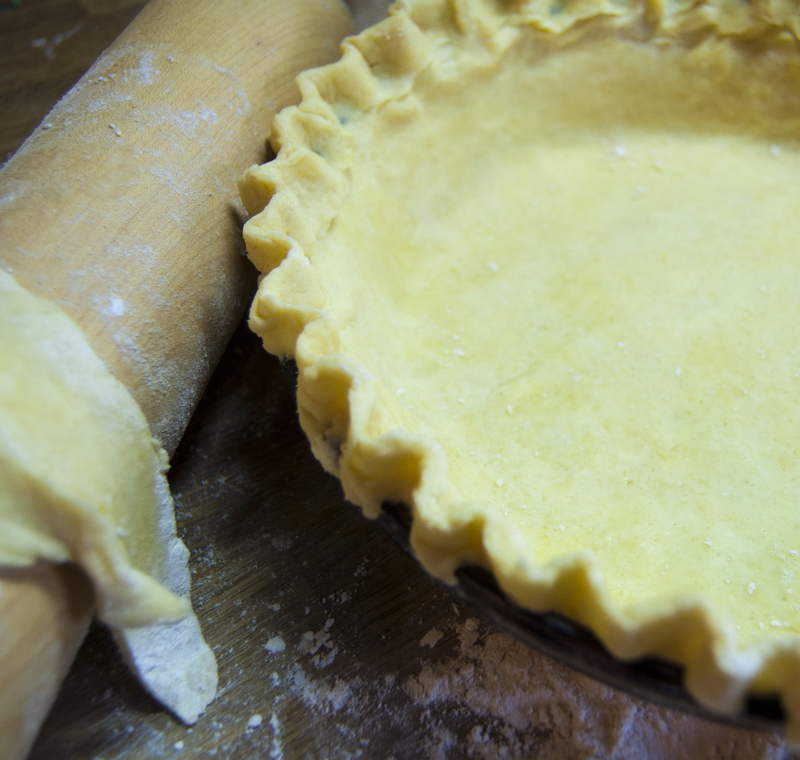 Place your crust in your pie pan and press the dough evenly around the edges. At this point you can get creative with your pie edge if you’re feeling ambitious. Cover and place in your refrigerator until you’re ready to fill it up with the pie filling. In a large bowl whisk pumpkin, egg yolks and egg until smooth. 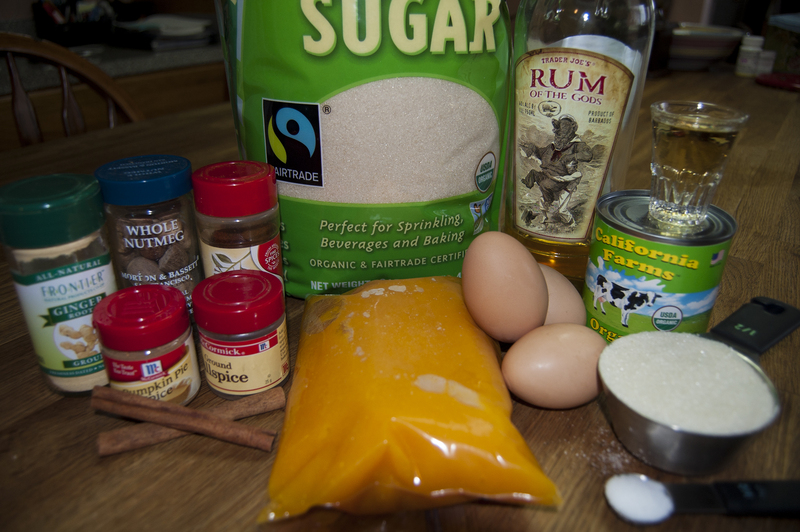 Add Sweetened condensed milk, sugar, spiced rum (don’t forget to take a shot for science! ), nutmeg, ginger, cloves, allspice, cinnamon, pumpkin pie spice and vanilla. Pheww that’s a lot of stuff. Another shot? Remove your previously made crust from your fridge (or your pre-made crust if you took that route) and pour your filling into the pie pan. Lightly tap and shake it to remove any pesky air bubbles. Bake in the oven at 425F for 15 minutes. Remove and cover your crust edge with foil. Put it back in the oven. Reduce heat to 350F and bake for around 40-50 minutes. Insert a knife in the center and check to see if it’s done. The knife should come out clean. If not, bake for 5-10 minute increments until that baby is done cooking. Cook time varies depending on your oven and may take up to an hour to cook. 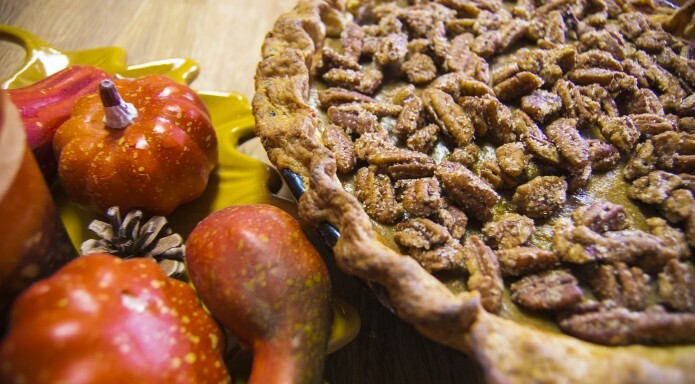 Remove from the oven and top with candied pecans. Allow to cool completely before serving. You’re all done! Now go eat some pie! 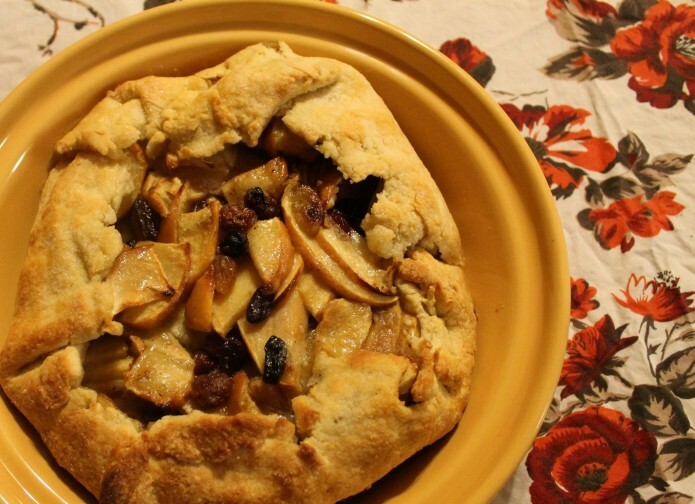 This free-form tart is easy to make and looks beautiful on a Thanksgiving dessert table! Place raisins in a very small dish, cover with boiling water and set aside. In a small bowl, combine flour, sugar and salt. 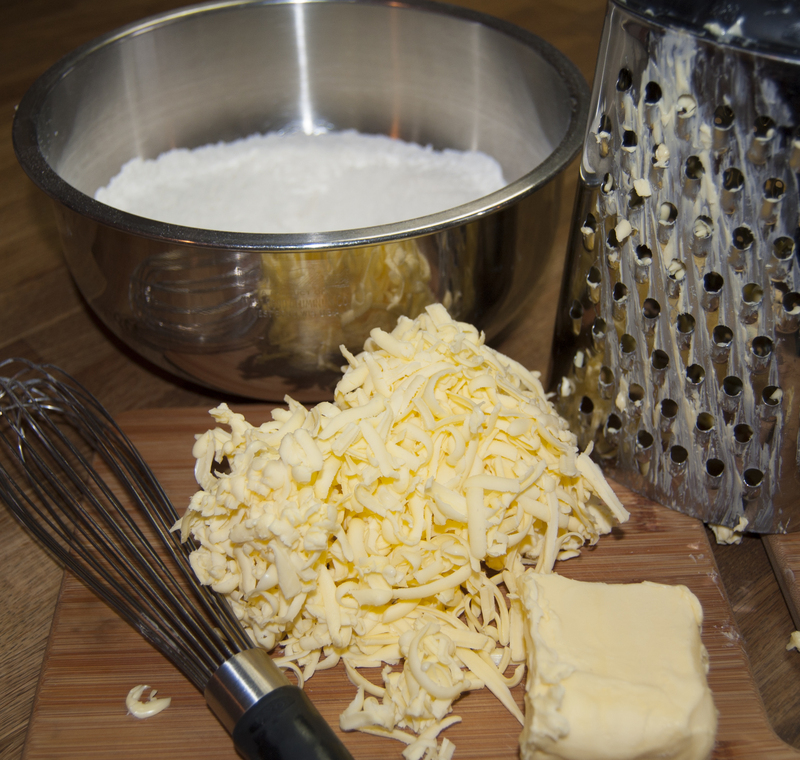 Cut in butter until mixture is crumbly. Gradually add egg yolk and water, tossing with a fork until a ball forms. On a lightly floured surface, roll out pastry into a 14-inch circle. Transfer onto a parchment paper-lined cookie sheet. Drain water off of raisins. Place raisins and apples in a large bowl. Combine flour, sugar and spices and lightly coat fruit. Spoon over pastry within 2 inches of edges. 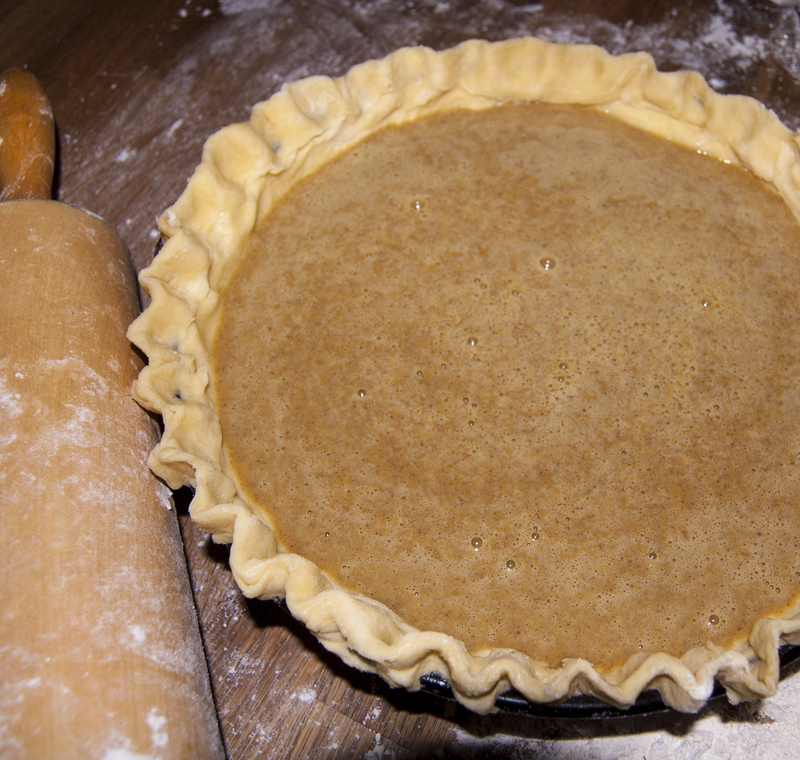 Fold up edges of pastry over filling, leaving center uncovered. Brush folded pastry with milk and sprinkle with coarse sugar. Cover pastry with a sheet of aluminium foil. Bake at 375 degrees for 35-40 minutes or until crust is golden and filling is bubbly. (At about 25 minutes into baking, remove foil.) Using parchment paper, slide tart onto a wire rack to cool. Enjoy!